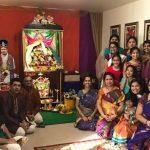 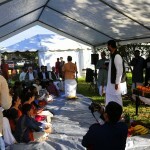 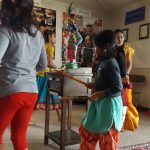 Houston Namadwaar’s Bhoomi Pooja was celebrated in a grand manner on Saturday, November 8th 2014 amidst Mahamantra sankirtan. 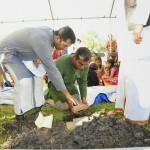 During the bhoomi pooja in the morning, Mahamantra chanting followed by slokas from Srimad Bhagavatam and Bhu stuti were recited along with the rendition of Kaliyaiyum bali kollum verses as the digging and brick-laying was done. 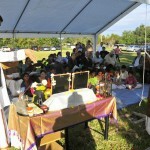 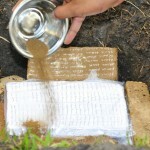 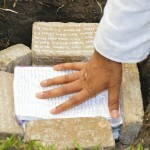 Nama prayer sheets written by devotees from Houston, India and other parts of USA were also placed in the pit along with holy waters and holy soil from India. 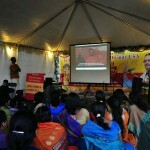 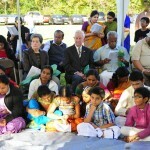 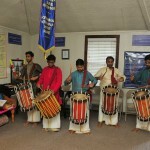 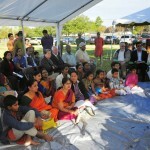 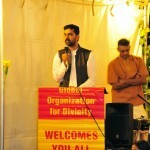 The Mayors of Manvel and Pearland and office-bearers of many Houston temples including Meenakshi temple, Guruvayoorappan temple, Sri Radha-Krishna Temple, Hindus of Greater Houston, Iyyappa group, Orissa Culture Center, HSS, Udupi Matha, Pearland Desi Group and several others participated. 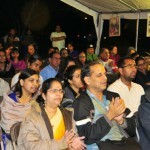 Numerous families and supporters from Houston also participated along with satsang devotees from Dallas, Boston, California, Detroit, New Jersey and Atlanta participated. 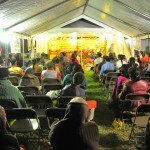 In the evening, Vidushi Smt. 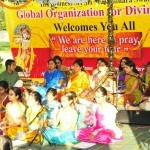 Rajarajeshwary Bhat and her group presented a musical performance “Pibare Nama Rasam”, comprising of kirtans on the greatness of the Divine Name composed by various saints. 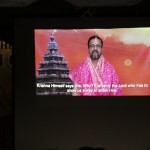 This was followed by a screening of HH Sri Sri Muralidhara Swamiji’s extremely inspiring blessing message for this occasion. 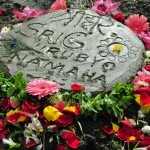 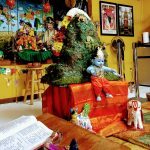 Sri Swamiji spoke of the glory of the Divine Name and said that the Name, even though it is simple and small, could accomplish huge tasks very easily. 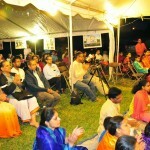 He said that as one chants the Name at Namadwaar, the divine energy from the chanting would be magnified a thousand times more by reflecting off the Super-Energy of the deities Sri Premika Varadan-Sri Madhuri Sakhi, who will be present in the Namadwaar. 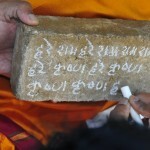 Sri Swamiji exhorted everyone to accumulate the wealth of the Divine Name that will help us overcome all troubles. 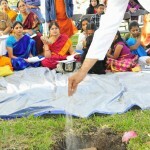 Following this, a few devotees shared their personal experience of the Mahamantra, after which Sri Ramanujamji spoke briefly and presented a prayer for the new Namadwaar to be constructed smoothly and quickly. 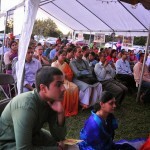 The evening concluded with resounding Mahamantra sankirtan for Namadwaar as well as for personal prayers. 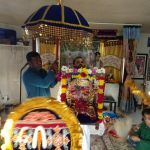 Continued prayers for the new Namadwaar construction to go on smoothly will be performed every Sunday at Namadwaar with Mahamantra sankirtan from 7 am to 7 pm. 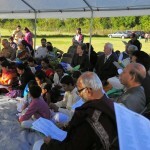 All are invited to join the prayer and also increase their “Nama” wealth in the process. 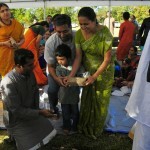 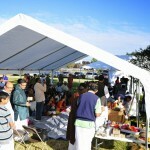 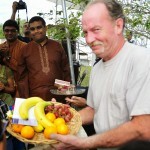 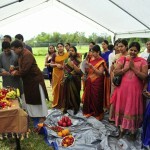 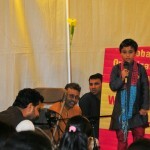 2 Responses to "Bhoomi Pooja Celebration at Houston Namadwaar"
I am so excited to see this beatiful scenes of houston. 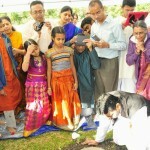 In one of the pics I can see Ramuji sprinkling something in that bhoomi pooja celebrations I have a personal comment that I felt he is springkling the nama seed so that it will grow like alavriksham with the grace of our Guruji.